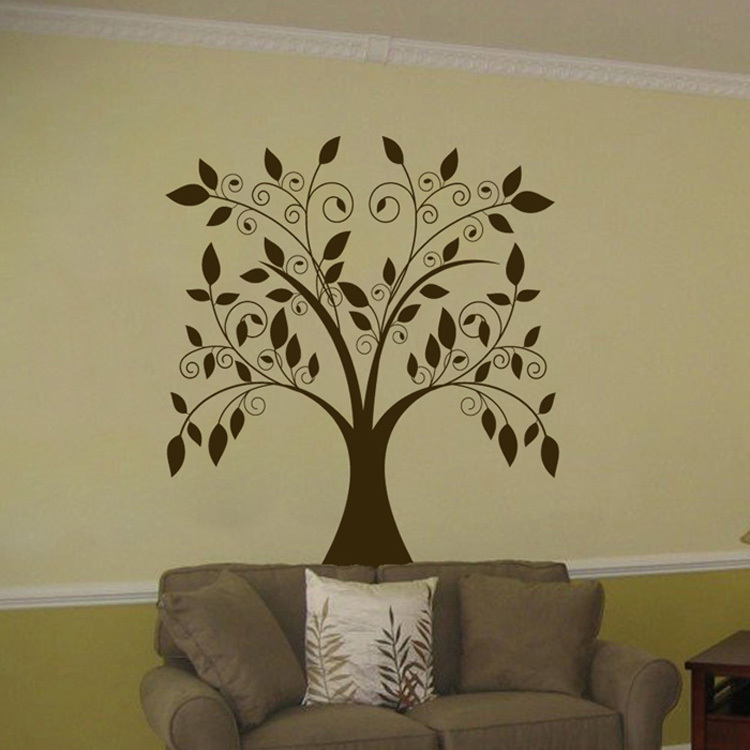 This is one of our most popular tree decals! A big, beautiful tree with pretty spirals and falling leaves all around.. I love it! Shown here in dark brown, this towering beauty measures approximately 43" wide by 46.5" tall. This tree comes in two pieces, which makes it easier for application. Once on the wall, it appears virtually seamless. I'm very happy with my wall, it's impressive! The DDOD side effects are soooo true! The decals were easy to install, beautiful and awesome finished results! I'm sooo happy! I have the Tall Leaning Tree Blowing with Blossoms. I'll be sending a pic soon! This is the only place i will purchase decals from, they are hands down the best and their products are wonderful! I just can't say enough what a pleasure they are to work with! I am PAST IMPRESSED with Dali Decals!!! I sent in a very special color dance photo of my daughter to have cut out from the background and made into a black silhouette. I needed them to do the work because my time was limited. Her hair is flowing free in part of it and that concerned me on how they would manage the detail and capture the motion of it, not to mention it was also a critical part of the photo. I’m SO relieved I let THEM do the work!! It has BLOWN ME AWAY!!! The detail is IMPRESSIVE! I could NOT have done nearly as good of a job as they did!!! Not only did her hair (imagine sweeping waves showing the flow of her body) come out gorgeous but they even included the delicate outline of the bracelet on her wrist and the dainty elastic tied bow on her Pointe shoe! Unbelievable attention to detail!!! I could NOT have imagined a better outcome! They EXCEEDED my expectations! They captured the stunning outline of her strong lean dancers body in a backward arch, upon exquisitely long legs standing on an impressive en’ Pointe! I just can’t even describe the silhouette they produced well enough to do it justice. I wish I could just send a pic. The work speaks for itself and is worth a thousand words! It was also easy to apply when you follow their instructions, took only about 30 minutes with one other persons help (it was 48 inches tall) and I applied it to the wall of her dance room. She already wants another of herself on the opposing wall! It’s breath taking too look at because her form is mesmerizing! It was worth every penny and I’d pay more! I feel like I am the one who got the better end of the deal! And I also put it on rush processing and they shipped it out the very next day! To do THAT kind of quality in less than a day is impressive! That’s the only word that keeps coming to my mind on ALL LEVELS….IMPRESSIVE!!! THANK YOU DALI DECALS for making my daughters 2013 Christmas a truly special and memorable one and a mommy’s dream come true!!!! We'll be coming back again and again!! !